Most owners of Canon printers look for Canon printer offline support due to the message that their printer is offline on the screen of their Windows or Mac. If you are facing this issue on your computer and Mac, read on to find out why it happens and what you can do to troubleshoot the issue on your own. Why is my Canon printer offline? The computer has lost connectivity from the access point. There is an issue in communication between the printer and the access point. Your Canon printer is not the default printer on your computer. Your Canon printer is incorrectly configured to the port. Before performing the steps given below, make sure that the power cable of the printer is plugged properly into an outlet. Restart your router to prevent the likelihood of a network failure. After ensuring these two criteria, you are now ready to perform the troubleshooting steps to change the offline status of your Canon printer. Restart Printer Spooler Service: Open the search box by either pressing the windows key on your keyboard or by clicking on the “Start” button at the bottom left-hand corner of your computer’s screen. Input “Service” in the search box and hit the enter key. Among the options that appear on the screen, choose “Services”. You will see the option “Print Spooler” on the screen. Click on the option and choose “Properties” from the list of options that appear on the screen. Set the startup type for the app as “Automatic” and click OK to save your settings. Then click “OK” to apply the changes and restart your computer. When the computer restarts, try to print something and see if you are able to see the print. Disable the “Use Printer Offline Feature” of the Printer: Launch the control panel application on your computer by inputting its name in the search box. Now, follow this route: Hardware and Sound> Devices and Printers. This will show up the printers’ catalog. Find out the name of your printer and then select the option “See what’s printing”. Click “Printer” to check if the option related to using the printer offline to see if the option is checked. If checked, click on the tick mark to uncheck it. Select the “Printer” option once again and then click on “Cancel all documents”. Now, to see whether all is well or not with your printer, print a file. Reinstall the Canon printer software on your computer: Generally, most print issues appear due to the absence of an authentic printer software on a computer. If even after trying out the steps, you find that the issue has not resolved, reinstalling the driver of the printer on your computer can do the job. Open the “Run box” by pressing the Windows key and the R keys at once. Next, type the command “devmgmt.msc” in the box and press the enter key. Find your printer under “Print queues” and then click on the right mouse button to bring up the option “Uninstall device”. Now, go to the official website of Canon to download and install it thereafter. This is your best bet to resolve Canon printer offline windows 10 issue. If you won a Mac instead of a Windows-based computer device, here is a list of steps to resolve the issue. 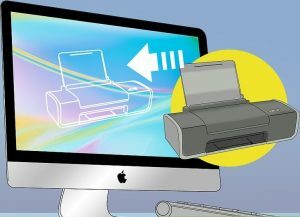 Before you try out any troubleshooting steps, it is strongly recommended that you should check if all is well with the physical connection between your Mac and your Canon printer. Make sure that all the cables are set up properly or else it can affect or compromise the connectivity between the two devices. If everything else looks fine, try out the troubleshooting steps that are given below. 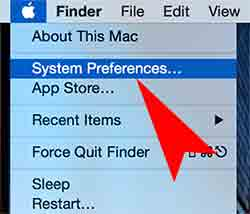 Tap on the Apple menu and select “System Preferences”. Go to the hardware section and push the option which says, “Print & Scan”. Now push the option “Printer list”. Select “Reset printing system”. Next, confirm that your Canon Pixma printer is securely connected to your Mac either via a broadband connection or through a wireless connection. 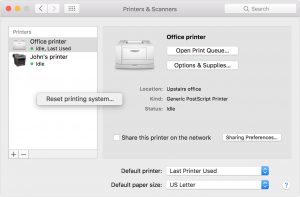 Follow the path: Apple menu->System Preferences->Print & Scan. Next, select the “+” symbol to add the printer to your Mac device. Lastly, choose the name of your printer from the list of printers on the screen. 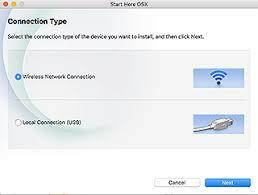 Once you do this, your Apple device will add it and install the latest version of printer driver software automatically. 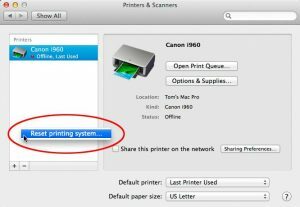 These are the steps to overcome the Canon printer offline issue on Mac and Windows-based computer devices. Try out these troubleshooting steps in the right sequence without eliminating any of the steps to connect your printer with your computer.